Welcome to the first of what will hopefully be more frequent (albeit probably shorter) updates! I have been meaning to write this post since the beginning of last week, but every night seemed like a good night to procrastinate. My reading is also suffering, as those of you who follow my reviews on Goodreads have probably noticed. This too shall pass. I’ve had a long and interesting week, so let’s get started. As some background, my school has two sites (North and South) as an artifact of combining two schools. North site is undergoing extensive renovation, with an entire new building being added, so South site is being phased out. I’m teaching entirely in one room on South site. Aside from having a Promethean board instead of a SMART board, I’m OK with this. Firstly, South site is a lot quieter. Secondly, it’s only five minutes (or less) from a bus stop on the route between Thetford and Bury. I have a ride, thanks to a teacher who lives literally at the end of the block, but it’s good to have a backup plan. Who’s running the Asylum (of the Daleks)? As foreshadowed, thoughts on Doctor Who ! I’ve been very excited for the new season (aren’t I always), especially because I get to watch it properly on the BBC. (SPACE in Canada has been pretty good, to be fair, but they still get the BBC America cut.) After the Doctor’s “death” at the end of the last season, I was interested to see what kind of trouble he would get into next. Oh, spoiler alert for “Asylum of the Daleks”. And, I guess, all of last season. Sorry. On Wednesday, I woke up at 4 am, considerably earlier than I am accustomed to doing. 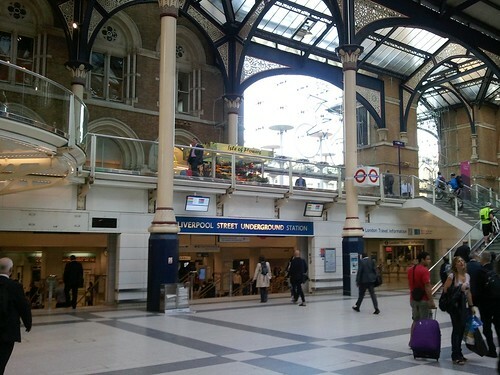 I had to catch the 5:30 train to Stowmarket, and from there I took the train to London Liverpool Station. After pausing to gawk at the size of it all, not to mention the number of people, I rode the tube to London Euston station. From there, it was a short walk to the building where Engage Education was holding our induction day. This consisted of several hour-long sessions during which two guest speakers presented about teaching in the UK. Much of the information was familiar to me as a recent graduate from the Faculty of Education. Some of it, particularly the information pertaining to UK-specific details, like being a form tutor, was quite useful.